Established in 1836 to aid the growing number of ships navigating the Penobscot between Bangor and Castine, Fort Point Light Station was built as the first river light in Maine. In 1857, the present tower and keeper's house replaced the original granite structures. The light station's fixed white light, a fourth order Fresnel lens with a 250-watt halogen bulb, is 88 feet above sea level and visible for more than 10 miles. The fog signal, a 1200-pound, cast iron bell suspended on a pyramidal tower built in 1890, is still visible today. For more than 120 years, civilian keepers, employed by the U. S. Lighthouse Establishment, tended this light station before the Coast Guard assumed operational duties in 1957. 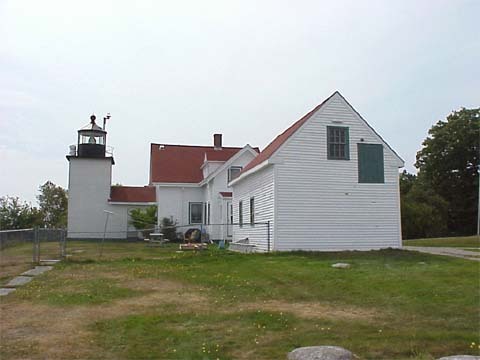 Today, with its automated light and fog signal, the light station is operated by Maine's Bureau of Parks and Lands as a historic site. The Fort Point State Historic Site is open Memorial Day - Labor Day. The tower and keeper's house are closed to the public but the surrounding land is accessible. From Camden, take Route 1 for 22 miles into Stockton Springs. In Stockton Springs take a right onto Cape Jellison Road. Stay on that road for 1.8 miles. Bear left onto Fort Point Road, which will lead you into the park.